A US UAV drone attack in Yemen, on Thursday 05/05/2011, targeted but failed to kill the mentor of Al-Qaeda in the Arabian Peninsula Anwar al-Awlaki, one of Al Qaeda’s most influential figures, USA reports said. Two brothers, Musaid and Abdullah Mubarak, believed to be mid-ranking Al Qaeda officials died in a drone strike in south Yemen on Thursday, Yemeni officials said. According to Yemen’s defence ministry, the missile fired by the drone hit a car in in the province of Shabwa. But reports from Washington now suggest US commanders had believed they had one of Al Qaeda’s most valuable targets in their sights. 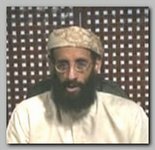 The reported attempt to kill Mr Awlaki is believed to be the first known US military strike within Yemen since 05/2010, when missiles mistakenly killed one of Mr Saleh‘s envoys. In 09/2010 Yemen’s foreign minister said that such unmanned strikes had been suspended. The report comes as Yemenis continue to take to the streets to demand that Ali Abdullah Saleh, president for 30 years, step down. According to Wall Street Journal there were several attempts to target Mr Awlaki on Thursday. He escaped an initial attack of three rockets fired at a vehicle in which he was travelling and then swapped cars with the two brothers, who were killed in a second strike by a single drone, the newspaper said. Washington considers the Yemen-based al-Qaeda branch the world’s most active terror cell (see also – Mailed Bombs Plot). It is estimated to have some 300 fighters within Yemeni strongholds, clustered around mountain ranges where the central government has little reach. Some analysts are convinced that, after the death of Osama Bin Laden in Abbottabad Raid, on 05/01/2011, Anwar al- Awlaki represents the greatest threat.